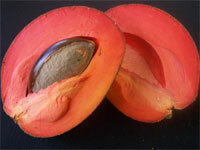 Other names: Mamey, Sapote grande. Intro: The fruit can spend up to a year on the tree before it ripens. Leave until soft then wait one more day for a great taste. History: Originates from Central America. Shape: The fruit is large and oval to egg shaped. Weight/size: Measures between 7.5cm to 15cm in diameter and weigh between 400g to 1.5kg. Colour: A leathery brown skin with reddish flesh, which encloses a single large seed. Buying/storage: Ripen at room temperature. To determine if ripe, scratch off the skin on the upper part of the fruit. If the skin below is orange to red, it is ripe. It should also give a little when pressed. Pulp may be frozen. Preparing/serving: Fresh or frozen pulp is usually combined with other ingredients to make milkshakes or ice-cream. To eat fresh, cut lengthwise and remove the seed. Small pieces can be mixed in a green salad or fruit salad. It makes excellent jellies, pastes, and conserves. Variety: Pontin, Magana and other selections.